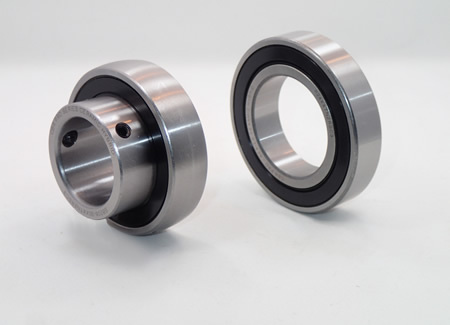 The typical performance gain when using ceramic hybrid bearings is approximately 5%, due to decreased friction, which results in less heat build-up. Also, because of the lighter weight of the ceramic ball, the speed rating is typically 25% higher than a traditional steel ball bearing. Our Pro-Series ceramic hybrid crankshaft bearings use top-quality Japanese-made rings, a molded, high-speed polyamide cage, and aerospace-quality ceramic balls. These crankshaft-specific bearings are built in our own bearing lab and individually tested to ensure accuracy and consistency. All are built with a C4 clearance. Our Pro-Series ceramic hybrid 63/22XXTN C4 features Japanese Koyo rings, a high-speed, molded polyamide cage, and C4 clearance. Common on most late-model Japanese 125cc two-stroke motocross engines. Our Pro-Series ceramic hybrid 63/28XXTN C4 features Japanese NSK rings, a high-speed, molded polyamide cage, and C4 clearance. Common on many Japanese 250cc two-stroke motocross engines. Our Pro-Series ceramic hybrid 6205XXTN C4 features Japanese NSK rings, a high-speed, molded polyamide cage and C4 clearance. Common on many European 125cc two-stroke motocross engines. 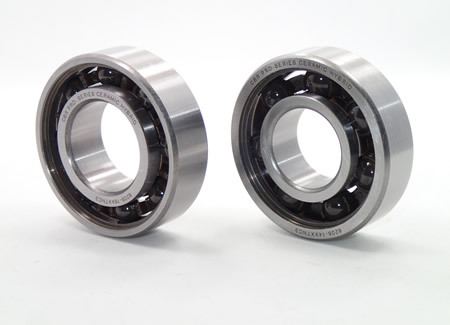 We offer ceramic hybrid front wheel and rear axle bearings, made specifically for the karting industry. 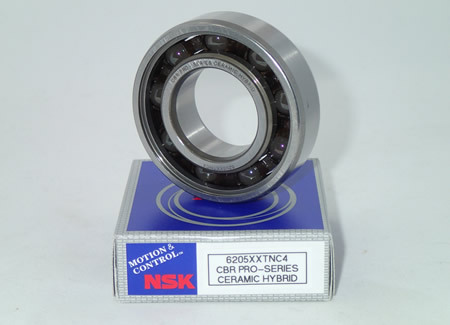 These bearings offer very low drag, with light contact rubber seals that can be easily removed for servicing, if needed. They also feature a high-speed, molded polyamide cage, top quality 52100 steel rings, and aerospace-quality silicon nitride balls. All front wheel-specific bearings are built with C3 clearance to allow for a press fit into the hub. 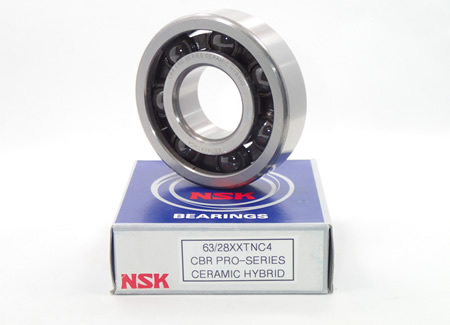 We also sell ceramic hybrid crankshaft bearings for most two- and four-stroke kart racing engines. Pro-Series ceramic hybrid front wheel bearings. Shown is a 6003, a 6905, and the 6905/12. We also carry the 99502 with or without a snap ring. 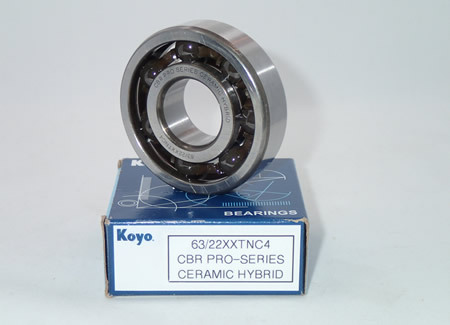 Pro-Series ceramic hybrid rear axle bearings. Available in all the common sizes, including 25, 30, 35, 40, and 50mm, plus 1.00”, 1-1/4”, and 1-1/2”. 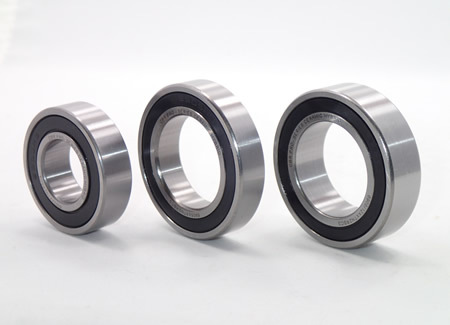 “R” series bearings are also available in 1.00”, 1-1/4”, and 1-1/2”. Shown is a SB206 (30mm bore) and an R24-2RS (1.500” bore).